FREE GIFTS with every watch! His and hers Charriol golf umbrellas, worth over HK$1000. Limited edition, with each piece individually numbered. 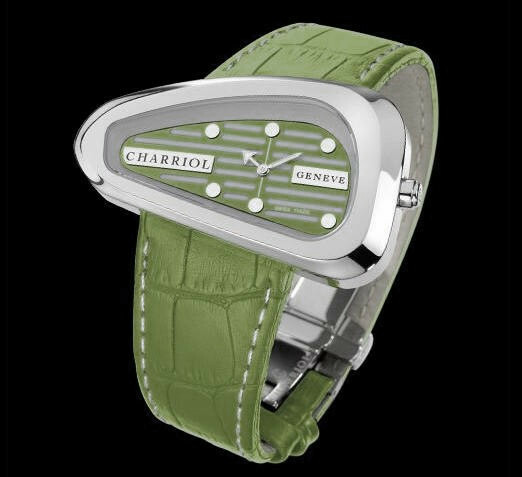 Inspired by founder Phillipe Charriol's passion for golf, CHARRIOL's captivating new creation features bold irregular lines. Slightly curved, outrageously asymmetrical and of impressive proportions, the steel case takes on the shape of a golf iron. This model's personality is strengthened by the dial's structured pattern and slightly eccentric orientation. IRONWATCH is available exclusively through HK Golfer and is available in pale green, black or white models. The stainless steel case measures 59 x 32.75 mm with a sapphire crystal and an ETA quartz movement. The dial has an "iron grooves" pattern, 6 stud hour-markers and luminescent hands. The leather strap has a double folding clasp.